There was no section to discuss Cisco’s Dynamic Trunking Protocol (DTP) so I decided to do it here. DTP allows us to dynamically form trunks on ports where two devices are speaking the DTP protocol. In theory this sounds great, it makes the network plug-n-play. In reality it is a security nightmare. There are no DTP commands in the interface config, you just have to know. 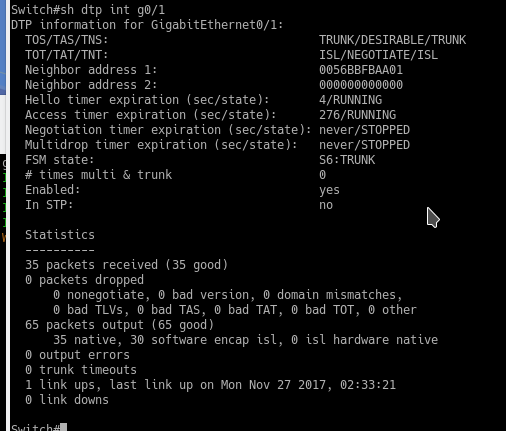 It is very easy, and proven very often that one can run a DTP emulator on a PC to form a trunk with a switch that has default DTP settings, thus forming a trunk with the switch for all vlans. Remember that in a vlan trunk if we do not specifically which vlans are allowed, all are allowed. 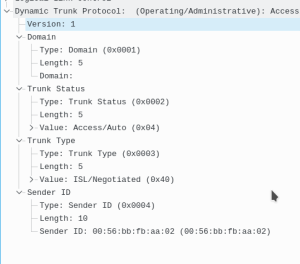 DTP will try to form a trunk on an interface, actively, and the only way to disable it is it set the port to be a static trunk, static access, it is also possible to disable the dtp negotiation via commands. This setting turns off DTP negotiation messages on the port. This mode is specific to DTP, it means it will actively send DTP messages, the other side must be dynamic auto or dynamic desirable to complete the trunk. This mode is specific to DTP, it means it will only listen for DTP messages, the other side must be desirable (actively sending DTP). By default DTP messages go out every 30 seconds. DTP is encapsulated in 802.3 Ethernet, the frame structure looks like this. There are 5 fields in the DTP PDU.